How might we leverage tangible user interfaces and multimedia devices to help improve communication and facilitate complex decision-making? Co-located, collaborative meetings are becoming increasingly expensive and complicated to coordinate especially in our increasingly global world. However, in-person meetings serve important functions: they are spaces where important and influential decision-making occurs and also meaningful spaces that foster mentorship, education, and interdisciplinary thinking. My research focused on augmenting co-located, collaborative decision-making through a smart meeting space. I conducted qualitative interviews and ethnographic style observation of three collaborative domains: conference program committees, college admissions panels, and grant awarding panels. Based on my findings, I identified design requirements for a multi-device, interactive, smart meeting space that integrates personal devices with large interactive surfaces. I outlined design requirements, designed a system of devices, sketched wireframes of user interfaces, and presented my findings to key stakeholders of the project. I led the research on this project, conducted all of the interviews, designed and re-designed the protocol, recruited research participants, synthesized and analyzed data, outlined the design requirements, designed the user interfaces for the devices, and presented findings to stakeholders for the conference room of the future. 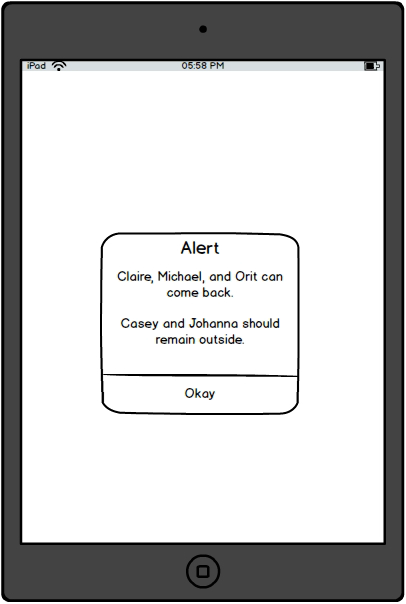 This project is a collaboration between myself, Orit Shaer, professor of Human-Computer Interaction at Wellesley College, and Michael Muller, Researcher and Master Inventor at the Cognitive User Experience group of IBM Research and the IBM Center for Social Software. Both Orit and Michael provided mentorship throughout my research process. They helped introduce me to the domains I studied, taught me about grounded theory methodology for data analysis, introduced me to potential research participants, and helped add valuable context and narrative to my findings. Students in the Wellesley College HCI lab have continued the project and are developing a state of the art lab of tangible user interfaces to continue testing out hypotheses and design requirements articulated as part of this project. Claire presenting her work at IBM Research to the Cognitive User Experience group in Cambridge, MA. Developed design requirements for leveraging large, tangible user interfaces. Presented actionable recommendations and prototypes to Cognitive User Experience group of IBM Research.